The idea for this post was sparked by an image of a wooden writing tablet that was written almost two thousand years ago (Fig. 1: I encountered it in a news letter from calligrapher Patricia Lovett). The tablet was dug up some time ago in a Roman army camp just south of Hadrian’s wall, in the north of England. Some 400 wood tablets with correspondence were found in the house of the commander, Flavius Cerealis, prefect of the Ninth Cohort. Remarkably, the tablets are only 1-3 mm thick, about the size of a modern postcard (more about the fortress here and about the correspondence here). The one in Fig. 1 is particularly charming and personal. It invites the commander’s wife, Sulpicia Lepidina, to her sister’s birthday party. The latter writes: “On 11 September, sister, for the day of the celebration of my birthday, I give you a warm invitation to make sure that you come to us, to make the day more enjoyable for me by your arrival. […] Give my greetings to your Cerialis. My Aelius and my little son send him their greetings. I shall expect you sister. Farewell, sister my dearest soul, as I hope to prosper, and hail.” (Source) Astonishingly, with this tiny scrap of no more than 223 mm wide we have in our hands a two-millennium-old text message sent between two sisters, concerning a matter as trivial as a birthday. As scholars have remarked, this is one of the oldest surviving specimens of a woman’s handwriting, which makes the tiny scrap even more memorable. Produced with wooden pens with stuck-on nibs (Fig. 2), the 400 surviving text messages also include correspondence from the field, likely sent by courier. The sub-commander Masculus writes to Flavius Cerealis, his superior: “Please, my lord, give instructions as to what you want us to have done tomorrow. Are we to return with the standard to the crossroads all together or [only half of us. Also,] my fellow soldiers have no beer. Please order some to be sent.” (Tab. Vindol. III 628, more here). This great (oldest-surviving?) order for beer, no doubt meant to be thrown out, survives because the earth preserved the wood on which it was written. Similar short logistical messages survive from medieval times, although their manner of survival is different. Fig. 3 shows waste material discovered in a book binding by students of Leiden’s Book and Digital Media Studies MA-program, for which I teach. A total of 132 paper slips were pressed together to form a board made out of “cardboard”. Quite unusual is the origins of the material: the recycling bin of a small court near Heidelberg, belonging to an unknown duke. 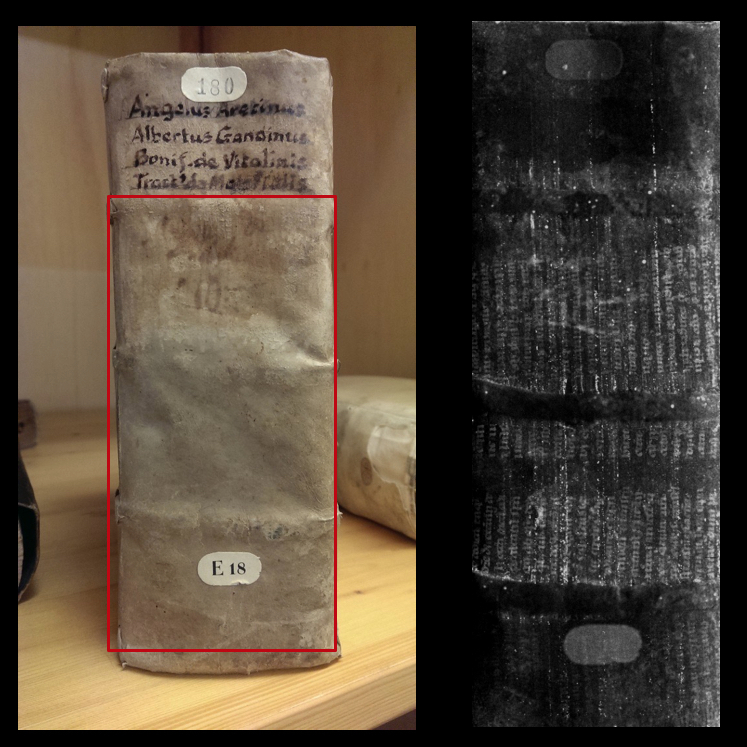 The material is not your usual archival material – charters, accounts and whatnot – but mostly concerns ephemeral material that is mostly lost from medieval times: “yellow sticky notes” that were sent from one servant to another, such as the one seen in Fig. 4. The scrap was written by the chamberlain (“hofmeister”) and it requests the amount of six guilders from the duke, whose servant is the recipient of the message. The back of the message (Fig. 5) also adds to our understanding of this hidden world of medieval text messaging. It shows to whom the note needed to be delivered (“kamermeister”) but also that it was folded into a small package for transportation (note the two folds). Another interesting note is a request to purchase some wild roses in Heidelberg, while making sure “to include some that are still in the bud.” (More about this case in this blog post.) Many of these slips were produced from recycled charters or account books. The messages were either written on their back (verso), or on a strip that was cut from their (blank) margin, as still visible in Fig. 5 (note the half words next to the word “kamermeister”). Why use a good sheet of paper if the message would be deleted immediately after use? Both the Vindolanda tablets and the medieval scraps that emerged from an early-modern binding form a time capsule with everyday conversations that do not normally survive from the past. We meet every-day people doing every-day things. Their manner of expressing themselves is untainted in that they do not try to be literary or witty, but merely convey a short message. They are part of a type of writing that was produced for short-term use and, ultimately, destruction. In that sense the messages from Antiquity and medieval times are not unlike the class notes I blogged about in the past, scribbled down by students and young children (Fig. 6) – more about notes and the bark sample in this post. 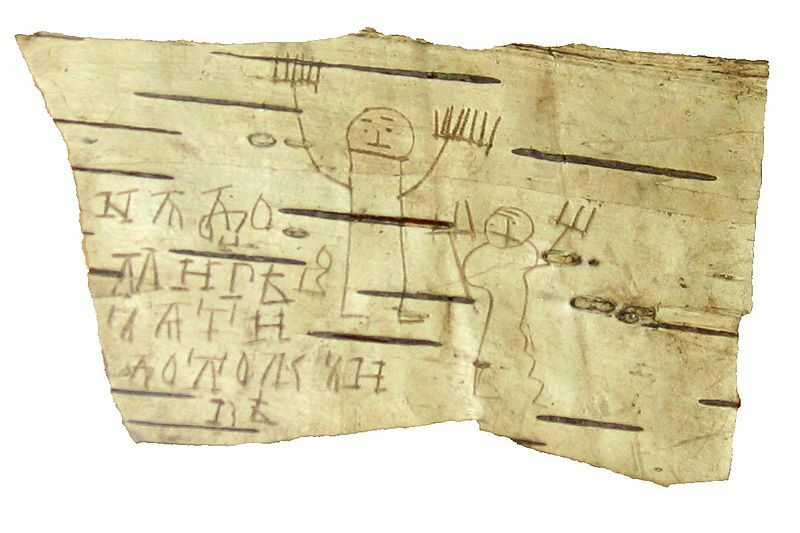 The parallel with the birch bark notepad is striking for another reason as well: it confirms that individuals in the past selected cheap materials for items that were meant for short use only. In that sense it makes perfect sense that the “text messages” discussed above were written on things that were just lying around: thin pieces of wood and slips of waste in a recycling bin. While the caches from Vindolanda and Leiden are remarkable, there are actually plenty of time capsules still out there. 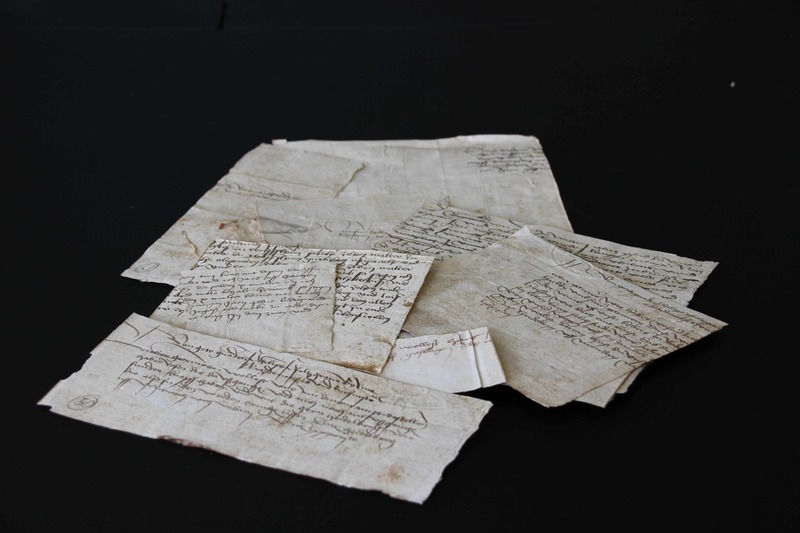 The average archive in Europe will contain several boxes filled with medieval waste material, which usually include a wide range of recycled “transitory” material, such as letters and notes (Fig. 7). 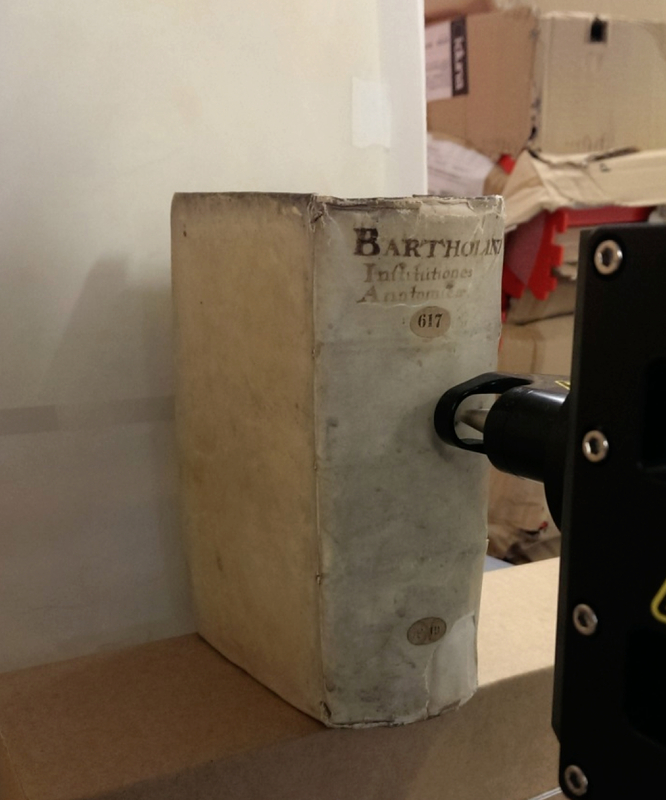 If the paper and parchment slips are the medieval equivalent of our modern text messages, written in a cursory fashion and forgotten about almost immediately after receipt, these archival boxes are like the memory chips of our phones. They allow us to read conversations deleted hundreds of years ago, connecting us to real medieval individuals doing real medieval things. Postscriptum: as pointed out by Sarah Bond (@SarahEBond), similar to the genre discussed in this post is the ostrakon tradition from Antiquity, whereby short texts (quotes, notes and drafts) were written on pieces of broken pottery. Sarah forwarded this specimen with a quote from Homer; other examples are found in this Tumblr post I wrote some time ago. Book historians tend to compare features of the medieval book to body parts. 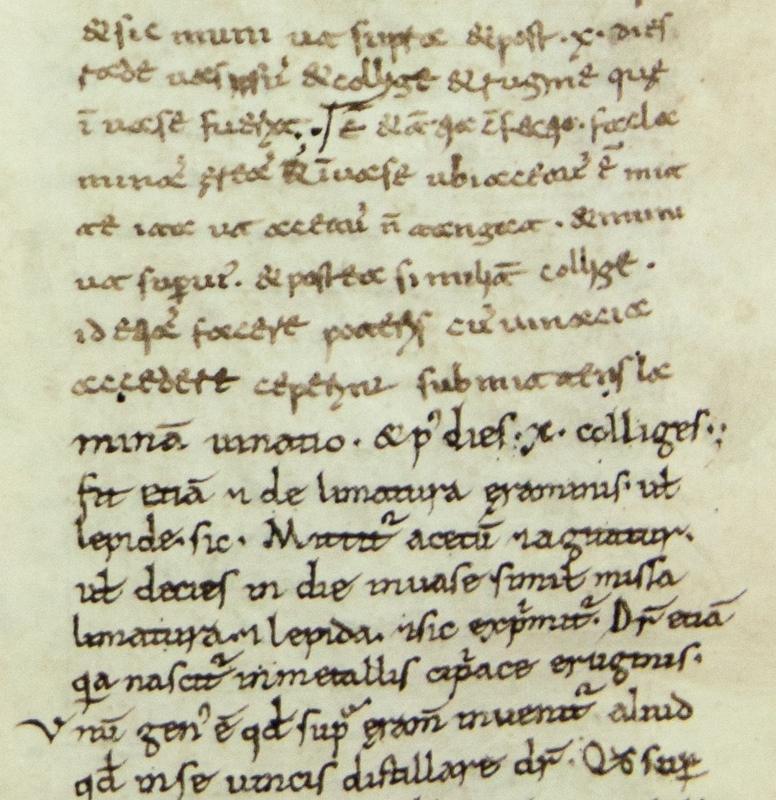 Thus the manuscript’s “head” (top edge) is connected to its “spine” (the back) via the “shoulder” (the area where board meets spine). 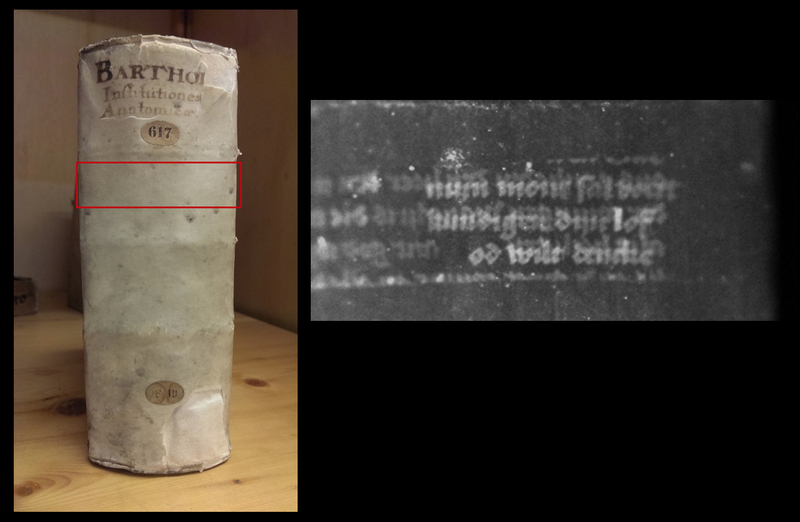 There are even terms that compare a medieval book’s physical features to human activities or conditions. A large letter with a lively figure inside is called a “gymnastic initial”, while line ruling that is nearly invisible is “blind”. I could go on and explain how other, seemingly unrelated, objects have been used in bookish terminology (the “diaper pattern” is my favourite), but you get my drift. This post takes this projection phenomenon a step further. 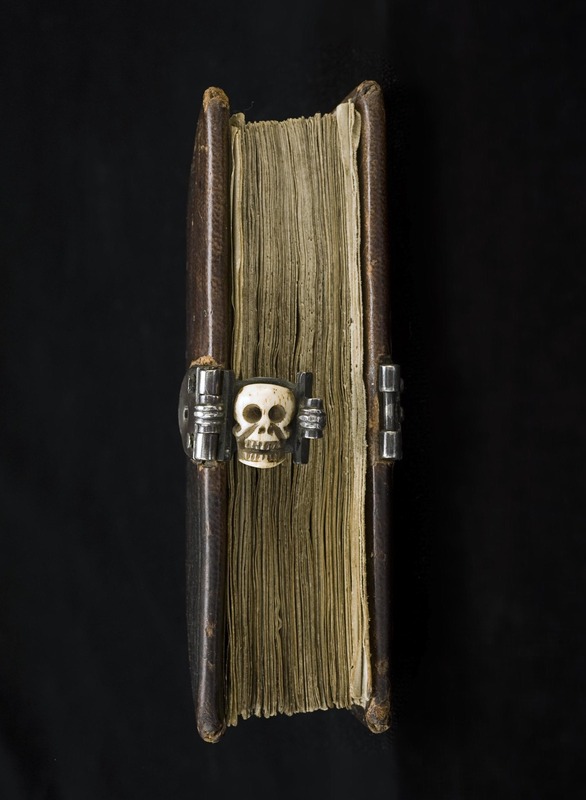 It shows how one particular feature of the medieval binding eerily resembles a body part, not just in appearance but even in function: the clasp (Fig. 1). 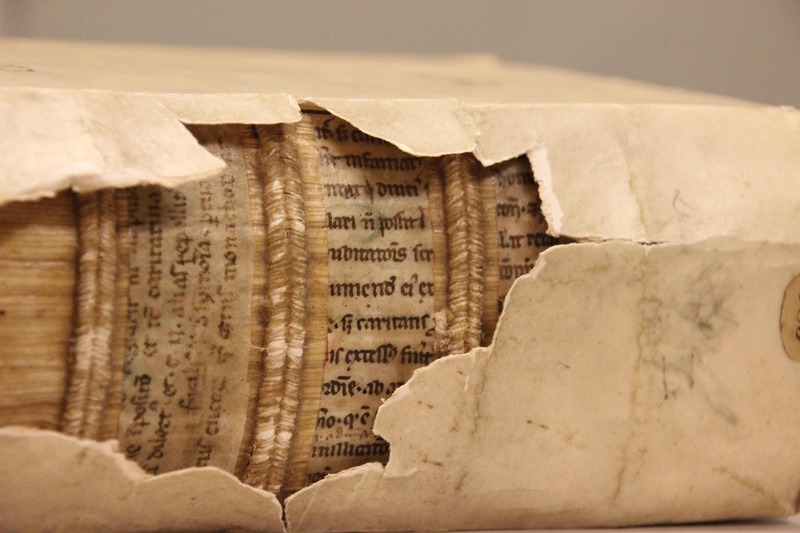 Medieval makers of manuscripts paid just as much attention to closing the book as they did to opening it. 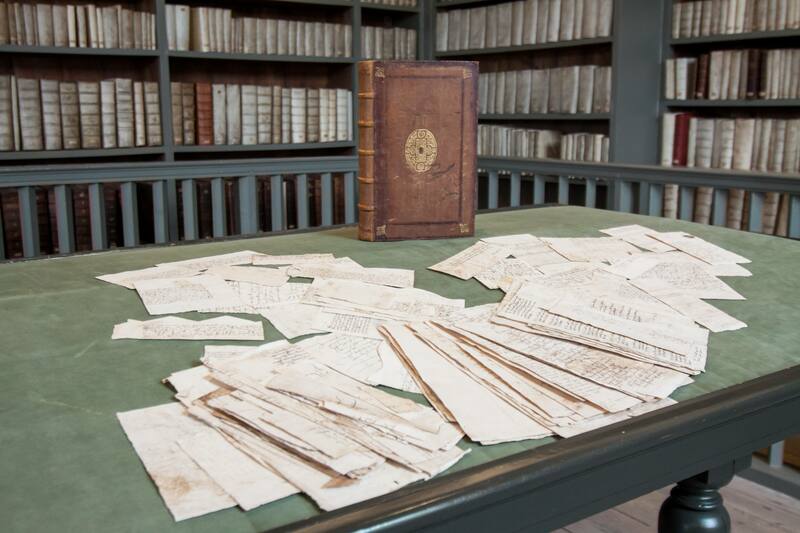 In order to preserve the organic pages, which were often made of parchment, it was necessary to keep the volume tightly closed when it was not used. Not only did this keep moisture out, but parchment also has a natural tendency to buckle, especially when handled at room temperature. In fact, parchment pages curl up with so much force that the wooden boards would be pushed open were it not for a smart device designed to keep the lid on: the clasp. The clasp is like an arm that extends from the one wooden board to the other. Indeed, I find it hard not think of clasps as hugging arms that embrace the leaves, safeguarding them from the harsh reality of medieval book use. Appropriately, the primary purpose of the clasp was to protect the pages. 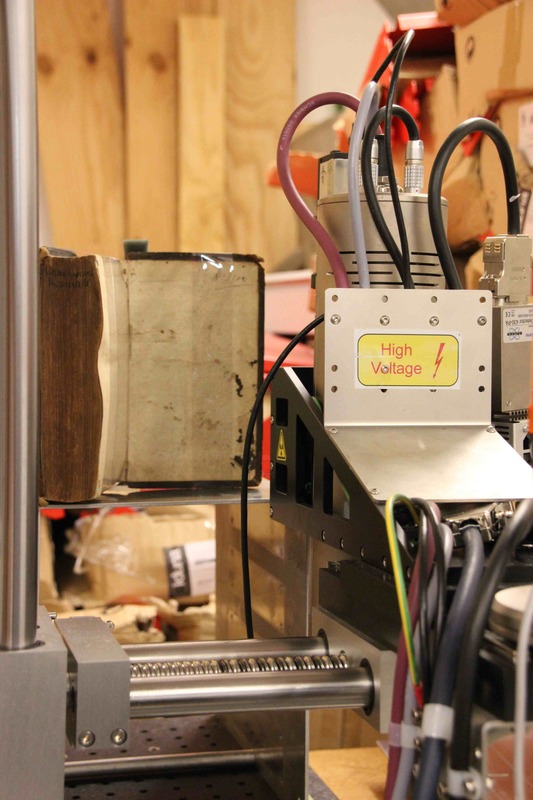 They generated the pressure needed to keep the pages flat, while producing a firm object that could withstand every-day use in a medieval library – like falling off a desk or a shelf. At the end of the arm a tiny “hand” locks into an extension – we could call it a “handle bar” – as clearly visible in Fig. 1. 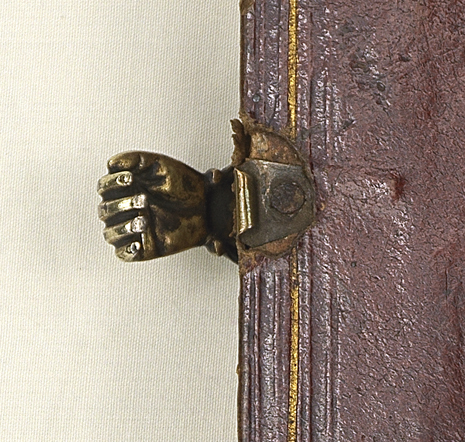 How great that some book binders played with the image of a hand grabbing onto the opposite clasp, as this eighteenth century example shows (Fig. 2). Generally, two clasps were able to contain the force issued by the buckling parchment of a book. However, it was important to get it right as a bookbinder. When the distance between the one end of the arm (the “arm pit”) and the handle bar was too large, there was insufficient pressure. By contrast, if the distance was too little, the book did not close. 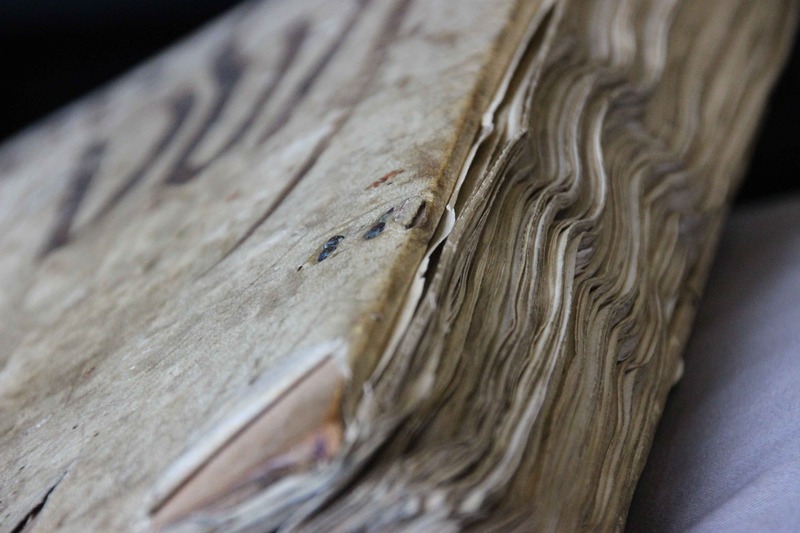 Medieval manuscripts that have lost their clasps (by far the majority) show what happens to the bookblock when the pressure was too low: unhappy pages with a wavy pattern appeared (Fig. 3). Some readers preferred exotic clasps. A particularly remarkable specimen is seen in Fig. 4. The book it helps to close is tiny, no larger than an iPhone. Made c. 1500, it was designed for the road: it concerns a portable Book of Hours (or prayer book) that was carried around by a pilgrim on his religious pilgrimage. The clasp holding it closed is a skull carved out of bone. The theme is fitting for a pilgrim seeking redemption, finding his way along the dusty roads of medieval Europe. Every time he sat down to open his book he was confronted with his future, which looked rather grim: Memento mori, remember that you will die one day. Better smarten up and keep on going! The exoticness of clasps can also be connected to their number in stead of their shape. Clasps are a must for a peculiar binding known as dos-à-dos (or “back-to-back”). While such bindings usually hold two books bound together at their backs (hence the name), the National Library of Sweden owns a unique variant that contains no less than six books (Fig. 5). They are all devotional texts printed in Germany during the 1550s and 1570s (including Martin Luther, Der kleine Catechismus) and each one is closed with its own tiny clasp. A book with six arms and hands: it is quite the display of craftsmanship. 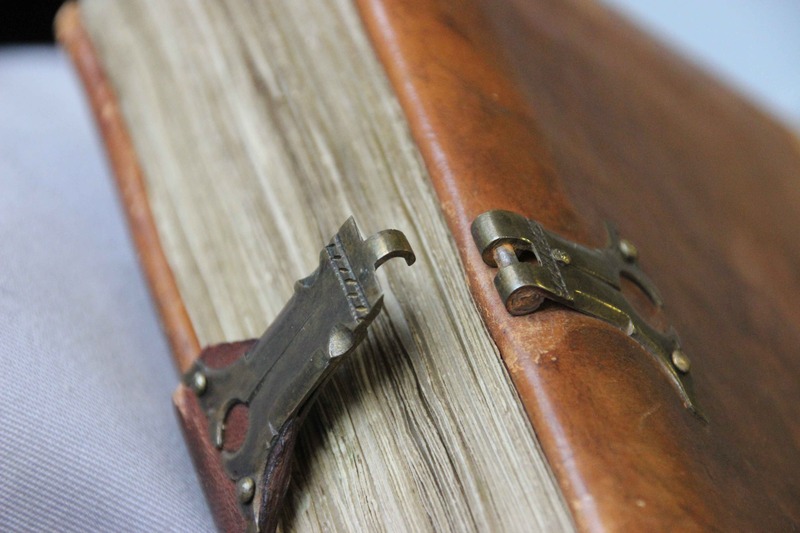 If clasps can be compared to arms, another feature of the bookbinding must be called “feet”. 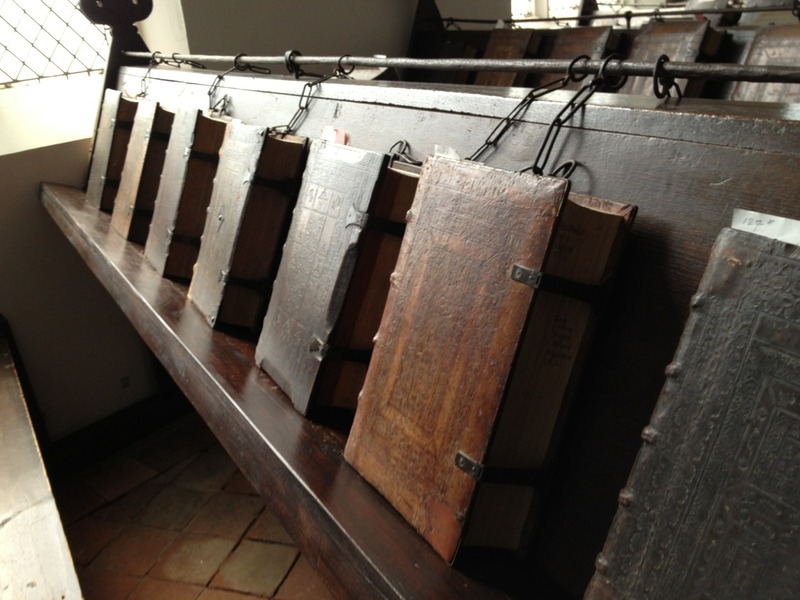 During the later Middle Ages it became customary to store manuscripts on lecterns. In lectern libraries, which were found in monastic houses and churches, readers consulted books on uncomfortable benches. The libraries often had a semi-public function, with outsiders walking in and out to consult books. To facilitate such use – and to make sure no books were unlawfully removed – the objects were usually chained to the lecterns (Fig. 7). Books in lectern libraries were not read on a flat surface (such as a desk), but erect – the objects were resting, after all, on nearly vertical stands. This kind of use came with a challenge: the shuffling that inevitably happened when the book was read, wore out the lower edge of the binding. 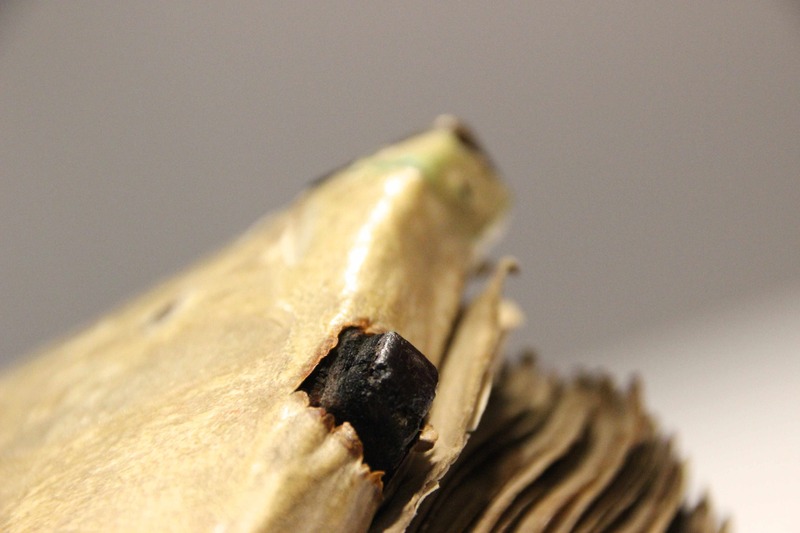 More importantly, since the medieval book block was flush with the binding, the constant contact with the lectern as the reader flipped through the book could easily damage the page. A simple tool was invented to prevent such damage: “feet” – tiny pieces of brass that hoisted the book up and made it hover, as it were (Fig. 8). The feet that are attached to bindings are often shiny. It shows just how much the book was used – and how much damage was prevented by the attached feet (Fig. 9). There is something very attractive about these body parts. They show just how much bookbinders and readers were in tune with the needs of the book as an object. They packaged them so that they could withstand rough consultation, while their designs also left room for a certain amount of fun – as the hand-clasp and perhaps even the skull-clasp shows. 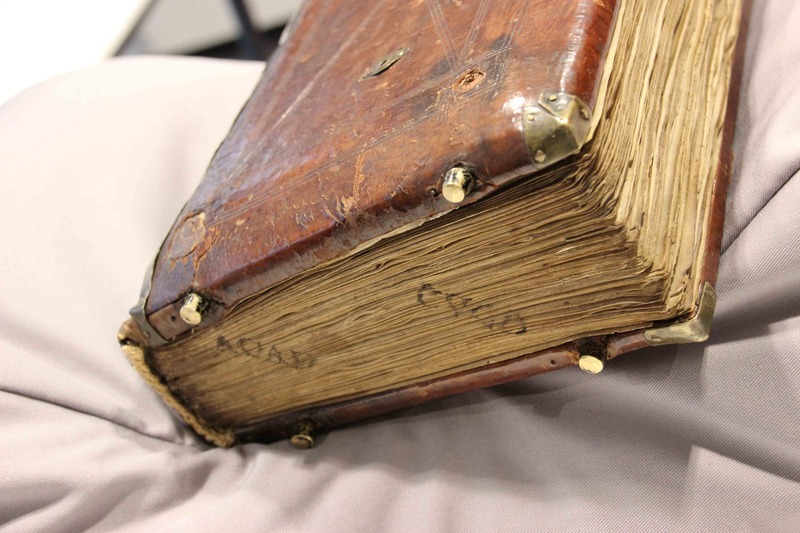 The hug given by these strong arms protected the book’s most precious cargo, the text, both from accidents in the medieval library and, as much as possible, from the inevitable decay of time. 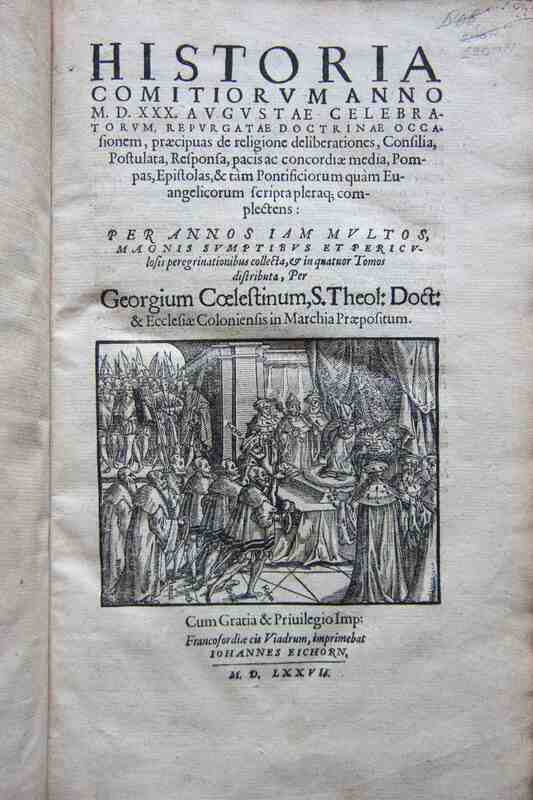 On my Tumblr I recently posted two entries devoted to a remarkable discovery made in the Book History class I am co-teaching with Paul Hoftijzer for the Book and Digital Media Studies programme at Leiden University. It concerns 132 notes, letters and receipts from an unidentified court in the Rhine region, jotted on little slips of paper. They were hidden inside the binding of a book printed in 1577, which is part of the Bibliotheca Thysiana, a seventeenth-century library in Leiden, established by Johannes Thysius (d. 1653). The gems were discovered by during our class while students were systematically going through the binding remains in the library. The tiny slips made headlines in Dutch and Belgian printed media and featured in a popular news show on Dutch national radio. Why are they so special? 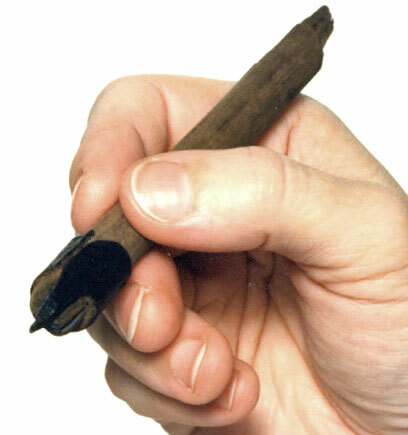 The slips are first of all remarkable simply because such small written objects rarely survive from medieval society. Due to their limited dimensions they tend to fall in between the proverbial cracks of the transmission process. There are few places where such objects can slumber undisturbed for centuries. Their low survival rate is also connected, however, to the fact that they were meant to be thrown out after use. In fact, this is what actually happened, although through the process an early-modern bookbinder unintentionally saved them. 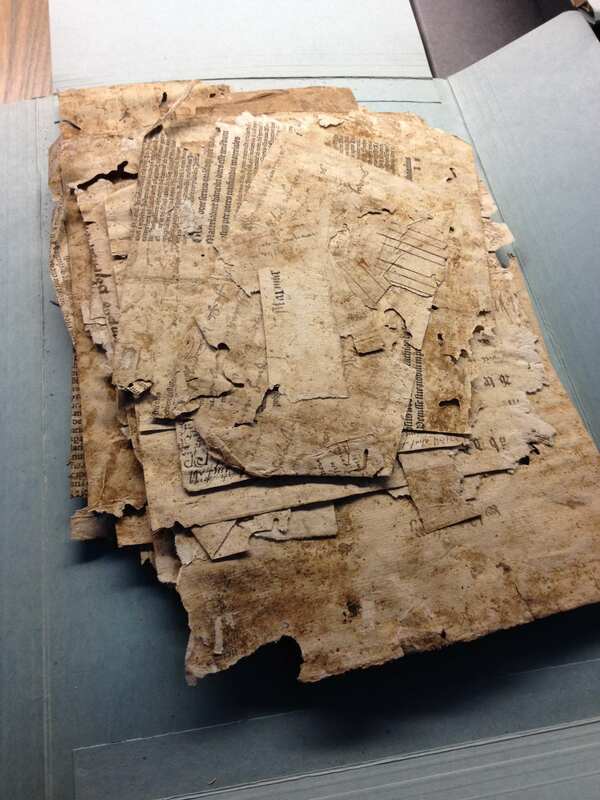 When a printed book from 1577 was to be fitted with its binding, the binder grabbed the 132 paper slips from his equivalent of a blue recycling bin and moulded them, likely wet, into cardboard boards. This is when their long journey to our modern period started, as stowaways hitchhiking on sixteenth-century printed matter. Thysius bought the volume second-hand and had likely no idea of the hidden treasures it contained. The collection also stands out because of its sheer size. 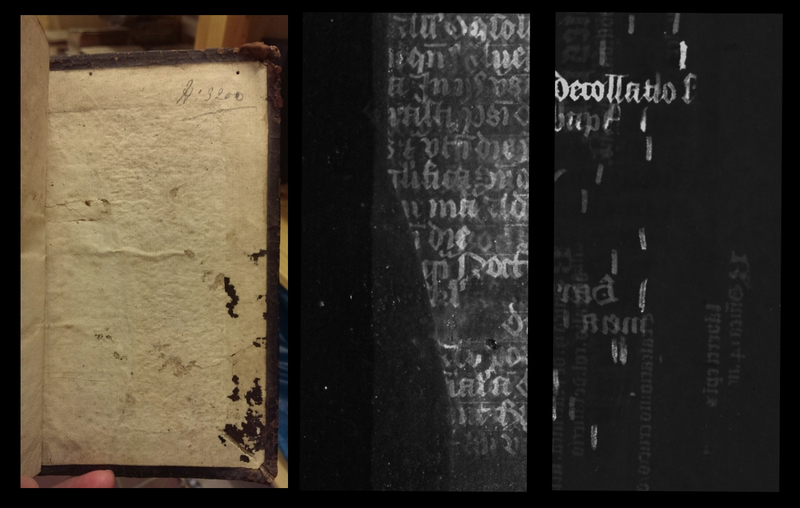 As I briefly explained in an earlier blog, recycling medieval written material was a frequent occurrence in the workshop of early-modern (as well as medieval) binders. However, the very high volume of leaves the binder used is exceptional. What is so striking about the paper slips is that they tell us everyday things that we normally rarely hear about in historical sources. 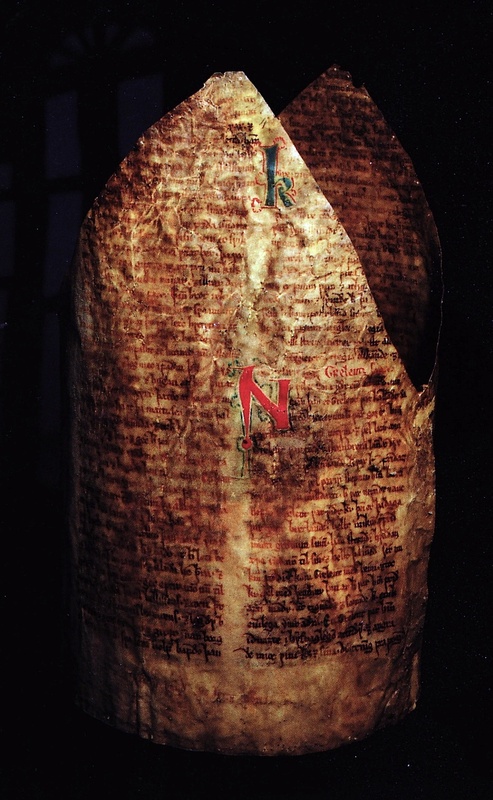 Take the note from 4 December 1461 sent to a chamberlain by a steward, asking “Could you please send me 6 guilders, because we need it?” It concerns internal mail from within the unknown household, likely delivered by a servant: the back reveals a fold and the designation “chamberlain”. We can almost hear him dash through the house, note in hand. A number of slips are receipts from payments: for work done by a carpenter, for the purchase of wheat for the horses of guests, and alike. Messages like these bring us as close to real medieval society as you can get. They are the medieval voices we normally don’t hear, that tell the story of what happened “on the ground”. My favorite slip is a tiny note written by (or on behalf of) Count Philip (d. 1508), who held court near the river Rhine. On 31 May 1486 he sent his servant to Heidelberg with a most charming request. “Could you please get me some wild roses?”, he writes, adding “But make sure to also include some that are not yet flowering.” It is a small miracle that we still have this 527-year-old paper slip, which is the equivalent of our yellow sticky note. (How many post-it notes do you keep after use?) Judging from the back, where we encounter part of a seal and an address, the note was cut from a letter. In other words, the paper used for this request was recycled twice: once in 1486, when the note was written; and once in 1577, when it was made into a board for a bookbinding. 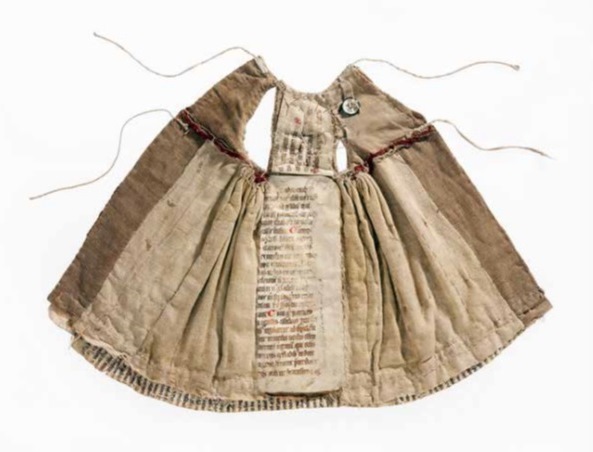 That such a twice-recycled object still exists and that it provides such detailed information about real people asking for real things, turns the archive into both a valuable medieval source and an exciting object to work with. Holding the request for wild roses in your hand really makes you think about how the flowers will have been used, who looked at them, and what conversations were held in the room where they were placed. Students will continue to hunt for fragments in Bibliotheca Thysiana and one of them will write his MA thesis on the hidden archive. The voices it contains will hopefully be allowed to speak more and louder. 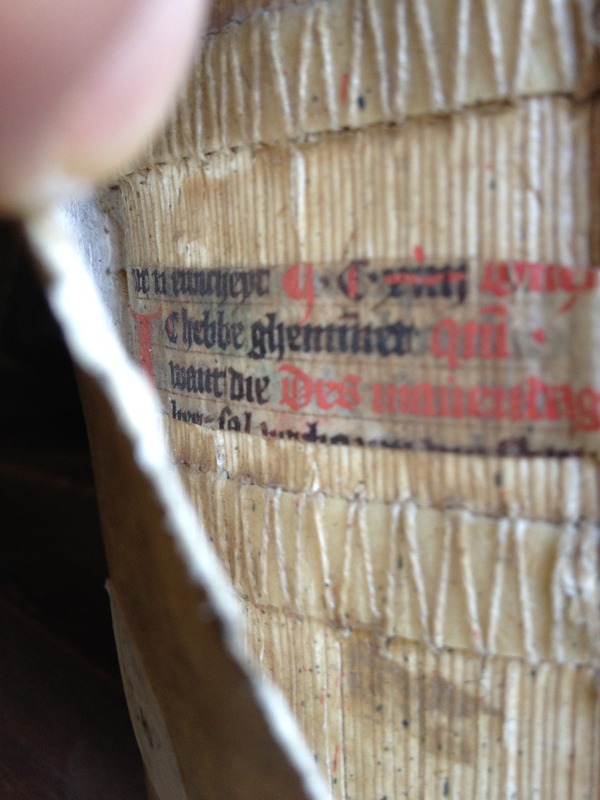 A while ago, this blog devoted a post to medieval manuscript fragments, parts of sheets that were cut up and used to support bookbindings. New fragments appear on the radar frequently. Just yesterday, for example, new fragments of Old French verse texts emerged at the University of St Andrews. Leiden University Library, my go-to place for looking at manuscripts, has hundreds of them, in various languages. Four seemingly insignificant strips, which I studied a while back, can be used to show just how important it is to take fragments seriously and to have a look at them when you study a text tradition. 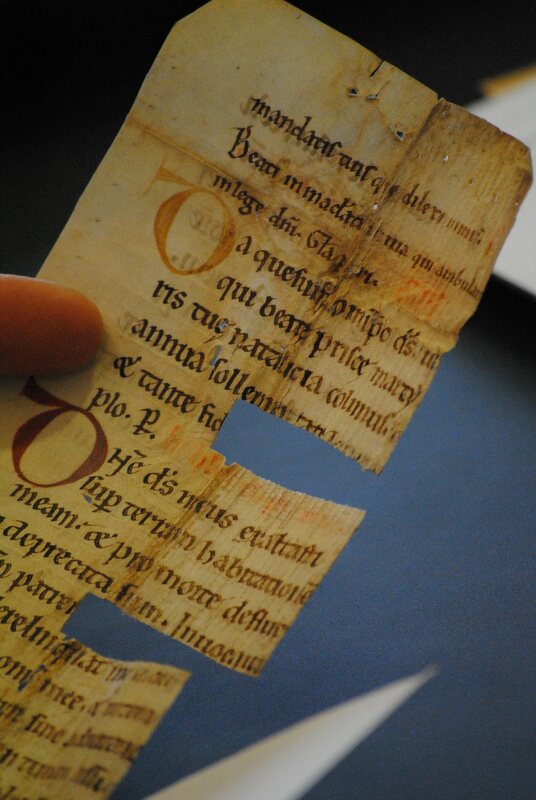 The strips in question, now sealed in plastic, once belonged to a Middle Dutch copy of the last book of the Bible, the Book of Revelation or Apocalypse. Apart from being disseminated as part of the Bible, the book also has a separate transmission, as is the case in Latin and other vernaculars. However, only six such manuscripts survive in Middle Dutch. This immediately elevates the Leiden fragments, which bear shelfmark BPL 2454 (13) and can be dated to 1350-75, to an important – seventh – witness of the tradition. 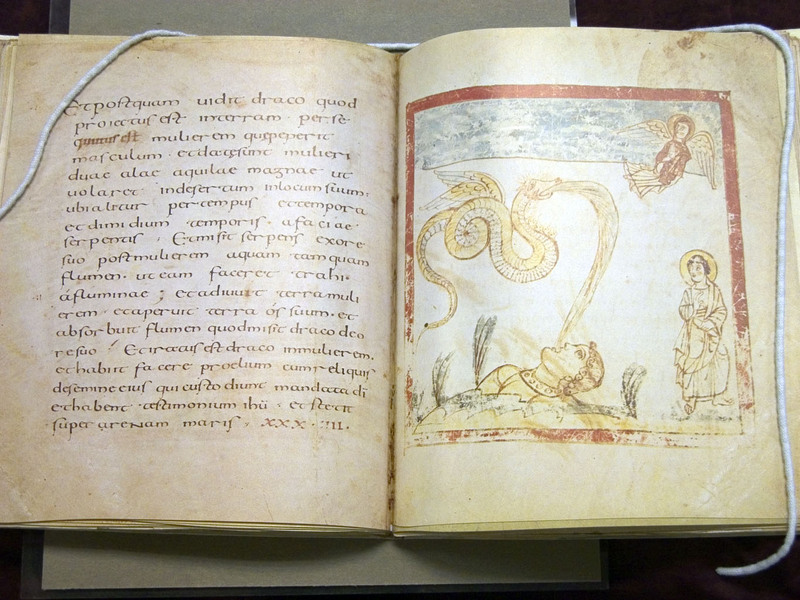 The oldest surviving manuscript, kept in the St Petersburg Library of Sciences, can be dated to 1325-50. The Flemish book historian Willem de Vreese found it in a pile of Middle Dutch manuscripts that were left under a dripping pipe in a forgotten part of the library. He was given permission to defrost the chunk of ice and “liberate” the twenty or so medieval books – like Han Solo being freed from carbonite. The best known manuscript, however, is Paris, Bibliothèque Nationale de France, MS néerlandais 3, made around 1400 in Flanders, most likely in Bruges. The Paris manuscript is of great interest because it is the only one that is illuminated. It contains twenty-two breathtaking full-page miniatures, considered prime examples of “pre-Eyckian” realism. Equally remarkable is the manuscript’s layout: each book opening contains a miniature on the right page, with on the facing page the corresponding text – a chapter from the Apocalypse. Text and image thus form a diptych. For the Apocalypse tradition this is very unusual. In fact, it is found in only one other manuscript, a Latin copy made in Tours shortly after 800 (now Trier, Stadtbibliothek MS 31). Back to the Leiden fragments. While not much of the original manuscript survives (the smallest of the four strips measures 41×12 mm, the largest 16x107mm), they provide crucial information about the decoration program of the Paris manuscript. The strips connect to Paris in two ways. First, they are illuminated as well, setting the Leiden and Paris copies apart from the other five. More notably, however, the fragments seem to present another instance of the unusual diptych tradition: the page out of which the strips were cut contained on the back the text of Chapter 12, while the front side held an image pertaining to Chapter 11. Certain elements from f. 12r of the Paris manuscript, presenting the image to Chapter 11, can be clearly made out in Leiden. Note for example how the crawling figure attacked by devils in the lower part of the Paris page (displayed above) is found on one of the Leiden strips as well – moreover, the man with his eyes closed is the same one as the individual being decapitated in Paris. We can learn quite a bit from these small snippets. Most importantly, the Leiden fragments suggest that the decoration program in Paris is not unique. The diptych presentation, it seems, may have been more widespread in Middle Dutch vernacular. 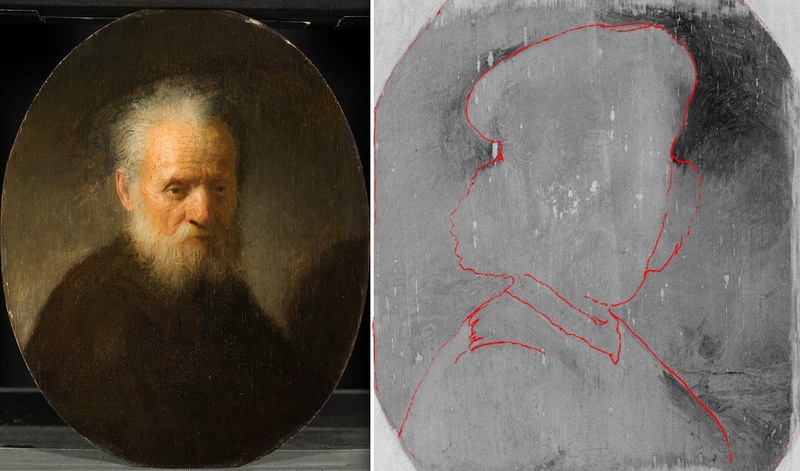 Also, the diptych design not only made use of high-quality miniatures, but apparently also accommodated plain colour drawings, as on the Leiden fragments, which were much cheaper. Readers who purchased such books thus seem to have been given a choice. Given that Leiden is the oldest one, predating Paris by several decades, the Middle Dutch diptych tradition, modest as it may have been, could potentially have had a long life, one that at least goes back to the early second half of the fourteenth century. 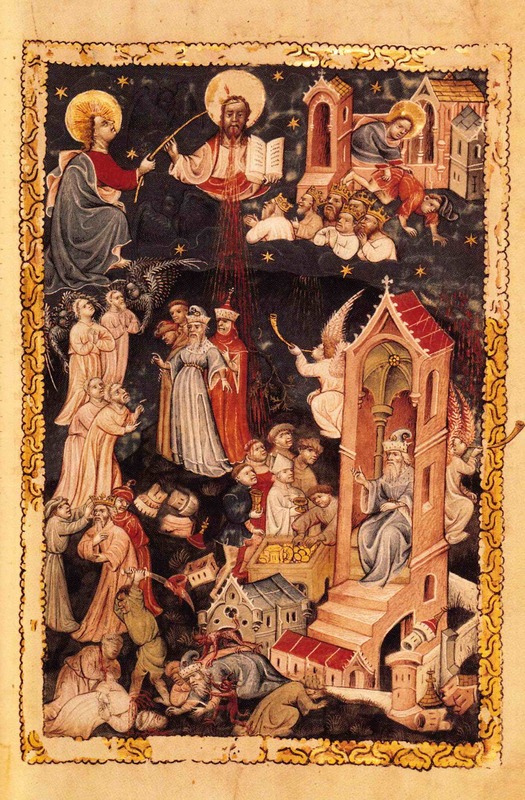 Most importantly for us fragment lovers, however, is that the tiny Apocalypse remains show there is life beyond the grave, like the message of the text itself. In the heart of the medieval book, where the quires are united and meet the binding, great secrets loom in the dark. This is the place where we can read things in the manuscript that cannot be read on its pages: whether it is composite and in what manner it is composite. The question of whether a collection of texts was copied continuously or whether it was formed by binding together independently produced units, is of the utmost importance for understanding the object’s genesis and for “getting” the texts as a collection. Providing an answer to this query is difficult, however, because it depends on facts buried deep inside the quire construction of the book – which may, moreover, not be obtained without upsetting librarians. Nevertheless, one must persevere, treading as carefully as possible, because exploring the dark side of the manuscript pays off. Composite manuscript: The booklets give themselves away by their varying dimensions. 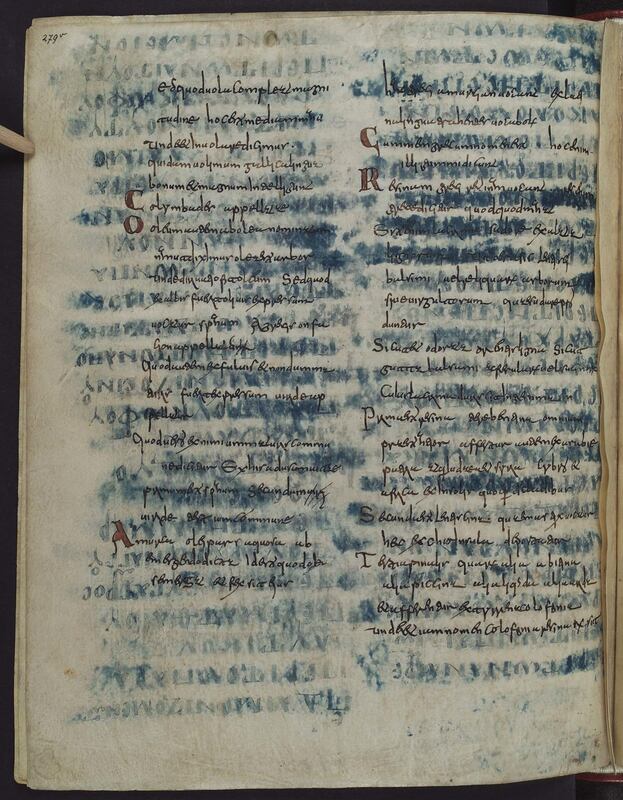 The first thing to do is assessing whether a manuscript is composite or not. Determining that an object is not composite is easy enough. A collection of texts copied continuously is usually written by the same scribe. Mind you, in such case the book may still be composite, for the scribe may have united individual units he copied in the past. However, if the writing style (duct) and ink color are the same throughout, and especially if all catchwords are in place and in the same style, the text collection was likely copied in one “go”. There is one trap, hidden in plain sight: a book produced by multiple scribes may still be copied continuously. Sometimes a scribe stopped working on a project and another took over. The individuals usually tried to hide such transitions by “breaking” at the very end of a page: the first stopped after completing the last line on the recto side of the leaf, the second started with the first line on verso. Less frequently, the switch may also occur in the middle of the page; or even in the middle of a line. This intriguing scenario can usually not be explained. Was the first scribe suddenly overcome with tiredness? Had the abbey beer of the previous night gotten to him? Did he have a blind date with the rubricator? Team of scribes: hand switch in the middle of a sentence (lines 8/9). The domain of composite books is much darker – and more slippery. This is in large part due to the fact that such objects can be composite in different ways. They may consist, for example, of units that were designed and created specifically to be bound together, while in other cases such units were merely united because of their similar dimensions. In some composite books all individual units were in use by themselves before they were bound together, while in others only some of them were, or none at all. Consequently, any two individual units of a composite book (and the texts they hold!) may have very different relations to one another: either they are new neighbors or their kinship predates the volume. Descriptions in manuscript catalogues usually do not clarify such relations. The better ones will mention that a manuscript consists of multiple units, but that is often the end of it. Take the following examples, all taken from existing catalogues: “Latin works on science and mathematics assembled from several 13th-century booklets,” “A miscellany of five separate manuscripts,” “A set of five volumes” and “Three independent manuscripts bound together.” The volumes are composite, but how? How are we to understand “assembled” in the first description? And how meaningful is the use of different terms in these examples (“booklets”, “volumes” and “independent manuscripts”)? Ultimately these descriptions show that bringing the genesis of a manuscript into play in your research normally requires you to go into the field and observe the object “in the flesh”. There is much to gain when you do. For example, the genesis of the book may tell us something about the availability of exemplars – and thus, perhaps, where we may situate the scribe. A scribe may have had all the exemplars he needed in front of him when he started to copy. Then again, he may not, for example because his hunt for exemplars had been only partly successful. Availability is a key consideration for the manuscript to become composite or not. 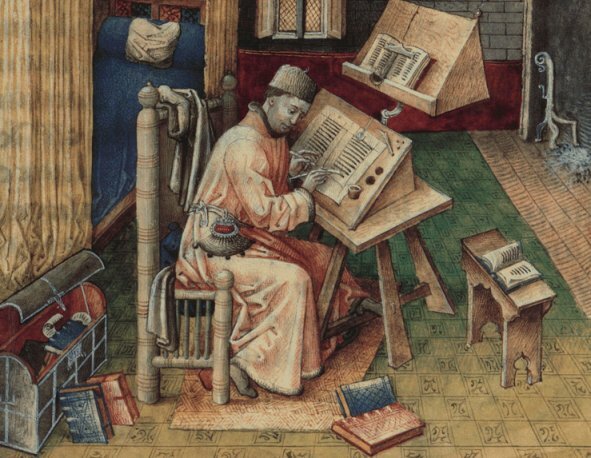 After all, the scribe could wait until he had all the material he needed and copy everything at once. The result would be a full manuscript if he copied a lot of texts, or a booklet if the planned collection was modest in scope. If there was much to copy but there was a supply problem, he could decide to copy the collection in “installments”. The result would be a series of booklets, all in the same hand, bound together in a single volume. As he was waiting for new material to become available, the scribe could start using the booklets he had already copied, adding new installments as he got his hands on more exemplars. 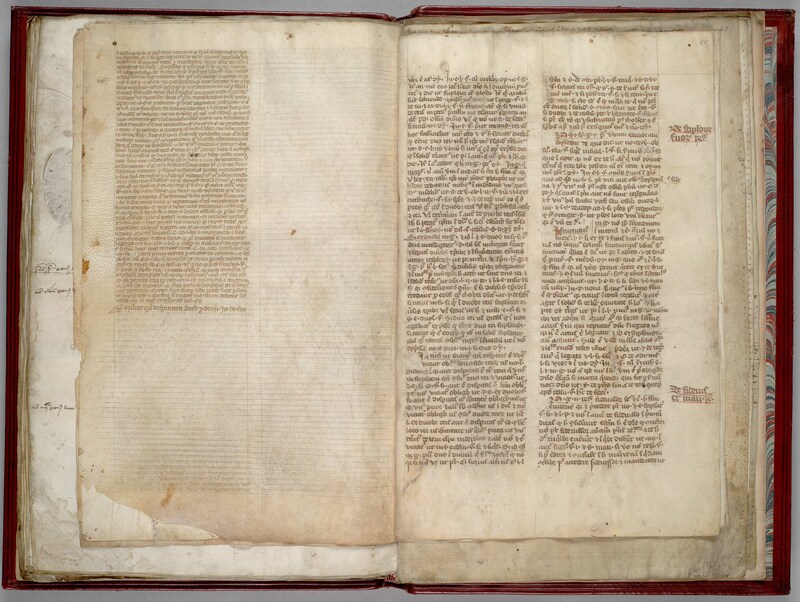 This is a different scenario again, one where some pages within a composite book (consisting of several parts copied by one hand) show wear and tear. Copy and exemplar in a depiction of Jean Miélot as a scribe. While the examples provided here may suggest that variation is endless, there are, in fact, only a limited number of ways to produce a composite book. Obviously, knowing the possible scenarios helps to deduce in what way a manuscript in front of you is composite. The first step, however, is to realize that the manuscript you are looking at, even when it is copied by one hand throughout, may be the product of extensive tweaking over a long period of time. P.R. Robinson, “A Self-Contained Unit in Composite Manuscripts,” Codicologica 3: Essais typologiques, ed. A. Gruys and J.P. Gumbert (Leiden: Brill, 1980), 46-69. Erik Kwakkel, “Late-Medieval Text Collections: A Codicological Typology based on Single-Author Manuscripts,” in Author, Reader, Book: Medieval Authorship in Theory and Practice, ed. Stephen Partridge and Erik Kwakkel (Toronto: University of Toronto Press, 2012), 56-79.